Personalised gifts perfect for Wedding Anniversaries. 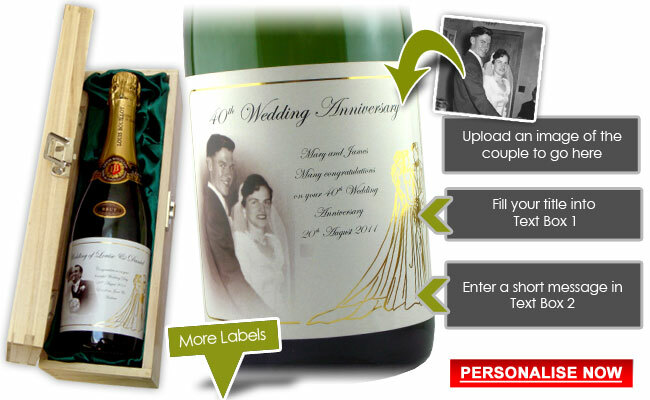 Personalise a bottle of wine with a photo of the couple and a personalised message to the couple on their anniversary. You can personalise a bottle of wine or champagne style sparkling wine especially for a 25th Anniversary, 30th Anniversary or even 40th Anniversary and more. Personalise a bottle of Champagne with an elegant label. Add a photo of the couple on their 30th Anniversary and present your gift to the couple also on thier 1st, 5th, 10th or 20th etc Anniversary. This unique and unusual gift and present is perfect and will be a great keepsake for many years to come. This unique gift and present also makes an unusual personalised gift for your parents on their Anniversary. Follow the links above to find the best wedding anniversary gifts suited to the anniversary you are celebrating or buying a personalised gift for. We have a wide range of unique and unusual wedding anniversary wine gifts that can be personalised by adding a photo of the couple and a unique message. An example of the message you can put on the bottle of personalised wine or personalised champagne style sparkling can be "Happy Anniversary, wishing you happiness today and for many years to come." Personalised wine or Champagne makes a perfect gift for a 1st anniversary gift. Add a photo of the couples Wedding from a year ago and personalise the Champagne anniversary gift with your message wishing them a happy anniversary and the wonderful years to come. Don't forget the personalised present gift can be made even more special and unique for your parents with a photo of them from their wedding day and a personalised and unique message from you to them. We have broken down all our anniversaries by year and you can choose the wedding anniversary gifts by the year. To pick the the appropriate wedding anniversary gift just click on the correct year. There are a lot of major anniversary milestones. Many people like to celebrate their first anniversary, and though many may consider the first one to not be a major one, it is important to a lot of couples because essentially it is their first anniversary and is the first of many to come and also reminds the couple of their wedding day. You can show this major milestone by getting the happy couple a gift for this anniversary year. Personalise the wedding anniversary gift present adding a photo image to the wine gift and you unique personalised message. The anniversary gift for the year they are celebrating can be made even more special by adding a gift box such as the wooden wine gift box or the normal card box which still looks really good. Anniversary gifts for your parents are difficult, do you get one for each parent or do you get one gift for both of them. With a bottle of personalised wine you can choose to get your parents a Anniversary gift for either both of them or one bottle of wine for each. You can put a photo of your parents on the bottle or maybe even a photo of your Father on one and your mother on another, maybe a bottle of wine wine for the gift. Then to make the anniversary gift for your parents even more special you can add a gift box for the wine to make the presentation look even more special. These presentation gift boxes are lined with green silk and really make the bottles and your anniversary gift for your parents really stand out. Anniversaries come round once a year and sometimes maybe a card or flowers will suffice, but for a big anniversary such as 10th, 20th or 30th Anniversary it's important to come up with a really good anniversary gift idea. Coming up with a good anniversary gift idea can be hard, and at Winemax.ie we have plenty of ideas that you can get your partner, parents or friends on their big anniversary. Our personalised bottles of sparkling champagne are a great anniversary gift idea. You can personalise the idea with a photo and add a message. To personalised this anniversary gift idea click here. Other unique anniversary gift ideas include personalised glasses, personalised candles and personalised plates.